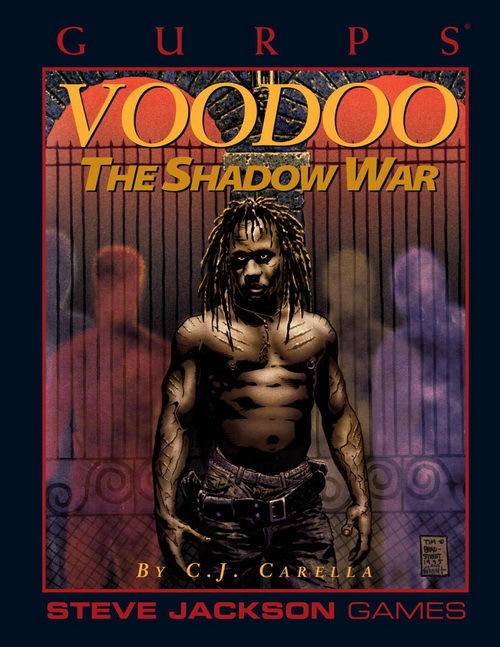 GURPS Voodoo: The Shadow War takes the myths of the mystical religions known as Voudoun and Santeria and gives them a twist, placing the believers and practitioners of Voodoo in the middle of a cosmic struggle. A new magic system replicates the way Voodoo priests and the shamans of many ancients cultures think it works. The Shadow War is a conflict fought on many fronts. 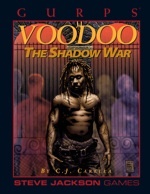 Voodoo Initiates contend with the Lodges, which consist of European magicians who have kept their occult power hidden and consider themselves the secret masters of the Western world. Beneath that struggle, some Initiates have begun to realize, lies a battle between Humankind and beings that have no use for power or wealth – only destruction. Unlike many "dark" RPGs, Voodoo is not about enduring horror, but fighting it. Human Spirit Warriors, monstrous In-Betweener renegades, and even ghosts can join forces and stop the manipulators and deceivers. The world of the Shadow War needs heroes, however frail or flawed they may be. Your characters may just be those heroes.